Have you checked out the fabulous blog Coco + Kelley lately? Read Cassandra's inspiring post on unique ways to hang art and see how Raji's work inspires her! And if you haven't already, check out Raji's post on How To Display Art: Part One & Part Two! It's no secret that I love art. It not only plays a major role in all my work, it in fact inspires me endlessly from a creative point of view. I can honestly say, I spend at least 5 - 10% of my awaken time studying or just looking at art because they really move me. Not every piece of art or every type for that matter. I do have certain types of works, certain artists I love much more than others but that is just my personal taste. At work, I often have projects where the clients already have a small or big collection of art that they love and cherish and it is always a definite influence when I design their homes. Not necessarily as a starting point for the whole design but I like to give a nod here and there. Sometimes, I help clients acquire new works of art. They are not always expensive but something that they will love. When it comes to how to display your art works beautifully, the first thing I think about is how much negative space a wall and the room needs. This is very important. Not just in the display of the art, but to ensure what ever art you place integrates beautifully with the room's design plan too. This is of course assuming that most people in general want a fairly peaceful and balanced room as opposed to a chaotic or disorganized room. This means when I start designing a room, I'm certainly starting to think about possible best walls/areas/ways to display art. It's something to bear in the back of your mind while planning. In the design process, whether the clients already have art works they want to use or they will be acquiring new ones, installing the art work is almost the very last thing we do and it is only then that a room feels complete and alive. After considering the negative space, next comes the all important scale. Beautiful art comes in all sizes, shapes and forms and regardless there is a way to display every kind to it's best advantage. Scale is about the relationship a work of art has to a wall and the room. Scale is also about knowing when to go proportionately larger and when to play with scale and do the unexpected. Large blank walls are great but not always needed. Challenges with very little wall space or walls of glass are always fun to deal with. It just means you think differently. Besides every art work is not meant to be on the wall. A wall of glass, for example, is primed to act as a beautiful and reflective backdrop for showcasing a great piece of sculpture. A group of art works displayed together, often referred to as salon style, can provide great scale and coverage to a room as much as a single large painting or a mural can. The effects are different though. An over-scaled painting or a large wall size mural tends to evoke a reaction that's in awe and the visitor is most likely to take a step back to realize the effect that large scale art has in the whole room. On the other hand, smaller works grouped together tend to coax the visitor to get closer and peer in at each little painting. There is a profound effect even in displaying a single and small work in a huge wall where say, 95 - 98% of the wall is empty. That little painting you love just got it's lime light, so make it a good one. In - Displaying Art: Part Two - we will discuss different display styles that will not only showcase your art beautifully but also act as a key design feature in a room. I think Domino called it Outfit to a Room?! When an outfit or an image of it arrests you so much that you can't forget it, it can very well translate to a room's design - just pick your battles. Not everything is for everybody. That means choosing outfits/images that you not only love but making sure the details are well within your reach or at least knowing how to make-do without some of that cache. In a previous post I shared photos of a September 2007 Vogue image which I loved so much and which inspired a room I designed. In this second part, I thought I'd share the details of how I actually went about designing the room. Let's break it down. 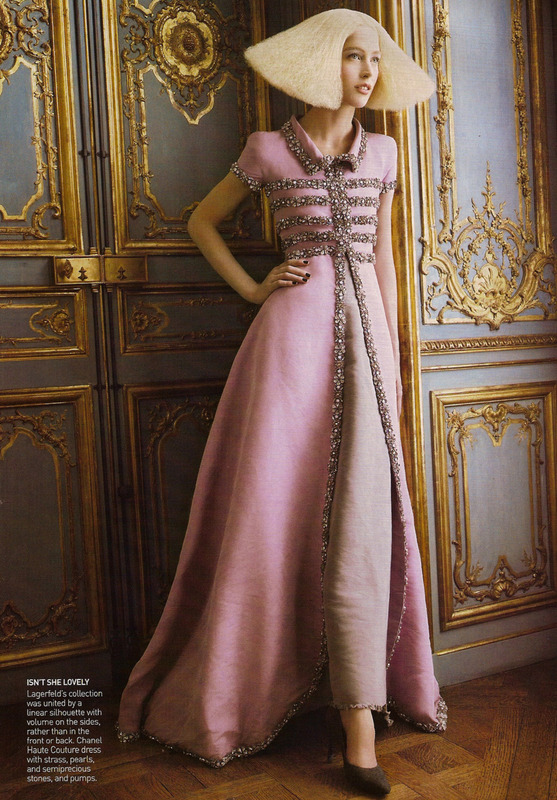 First off, the Christian Lacroix dress that Raquel Zimmerman wore is incredibly beautiful! The variety of colors, fabrics, textures and of course the cut and flow all had a role in it and so did the black hat. While the dress itself has a heavy influence from a Jane Austen like period fashion, the styling of Raquel's hair was much more contemporary with a very short, razor sharp cut and exaggerated volume. But you can still tell the Elizabethan influence there. I think the large black hat coupled with the hair style, cut through the period feel of the dress and brought it all down to earth, quite perfect for today. As if all this complexity was not enough, Grace Coddington ramped up the image's magic with the setting she chose - a very elaborate and detailed period room. So that puts the whole thing back to somewhere up there. I love the dress, but from a designer's point of you I love it way more in that particular setting. It makes all the difference (and more complicated!). So, of course, I took not just the dress but the whole photograph. Now for a little background on the room I designed. Unlike the gorgeous room in the Vogue image with all the period detailing, the room I had to start with was rather contemporary in feel with tons of windows and a whole lot of sun light. I first decided that there was no fighting that. You go with the light, respect the architecture and in fact celebrate both. We don't live in the good ole' days of 18th Century France, so why try? The painted walls, medallion curtains and carved and gilded moldings was not going to happen either. That means, I have a prosaic white shell. Nowhere close to the setting in the inspiration image. But, that's OK. Because I can still sneak in some of the gilding and the painterly patterns in the furnishings. Still, my first order of business was to introduce some of that warmth that you see in the Vogue image. Which, mind you, is also a reflection (captured by the photographer David Sims) of the light streaming by that window yet slightly shaded by the curtain. In cases like this it is that feeling you are trying to capture - that warmth. So, in came the large greenish beige sisal rug that instantly helped to warm up the room. Next came the large skirted sofa by Hickory Chair. This large beige sofa helped so much in two ways. First, the huge swath of beige fabric on the sofa again eased up all that white and brought in more of that much needed warmth but in a different tone from that of the rug. Second, the couture like detailing in the box pleated and buttoned skirt helped to bring some of that finesse and formality in the Vogue image but in a much more realistic and livable sort of way. Not to mention how it dueled a bit with the casual sisal rug. Layering of different tones, different styles and textures always helps. Next came everyone's favorite piece (and I think the couture equivalent) - the vintage Gio Ponti lounge chair. We upholstered the chair in a gorgeous pinkish plum velvet by Fabricut and paired it with a Rogers & Goffigon textured beige linen fabric for the sides. 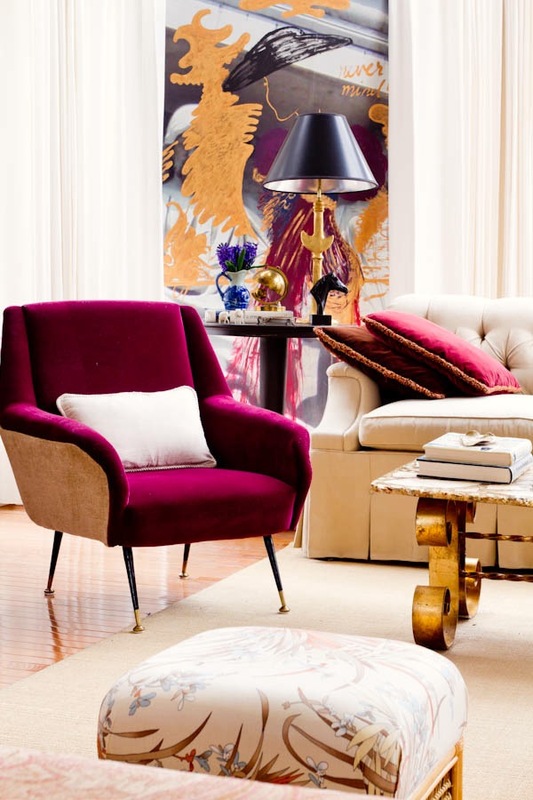 This contrast not only makes the chair interesting but gives the room that added layer of color contrast. But, it's the plum velvet and the lines of the chair that is the killer here. The modernity of the chair contrasts with the traditional style of the sofa beautifully. Now, bear in mind that when you translate an image of a dress into a room, you not only just take the colors but also the color proportions and the scale. Look at that Vogue image again. How much of the plum/pink in the dress occupies the whole image? About 25-30% may be? Then, that's all the plum that should be in the room too. Now it's time for some gilding and pattern to appear. The coffee table I chose is vintage and very much in the manner of those that French designer, Raymond Subes designed in the 40s. It has a terrific design and is unbelievably heavy. The base is gilded iron with a wonderful scroll pattern which reminds you of all the carved and gilded panel moldings in the Vogue image but in a more modern kind of way. The top is an assemblage of mother-of-pearl, blocks of marble and poured resin. The gold, creams, browns and whites together with the materials in the table top add that first layer of pattern to the room. 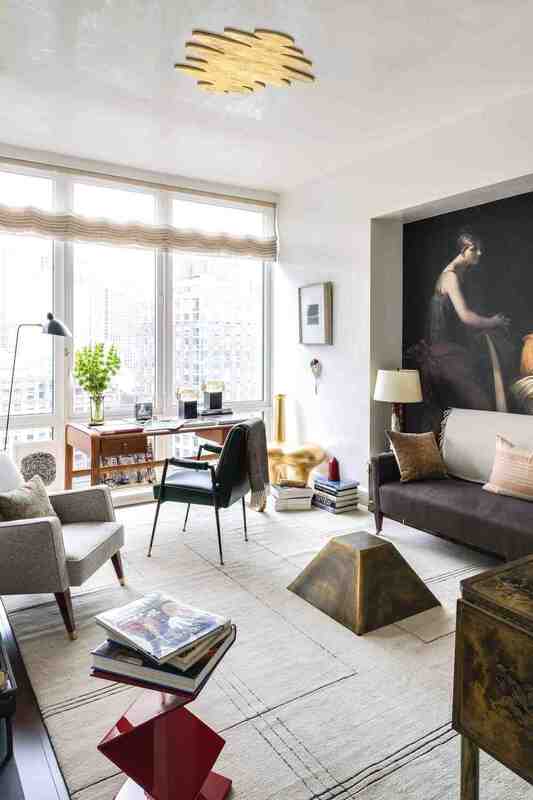 But, I felt the room needed a little more gilding and added the Giacometti lamp in the corner. The style of the lamp artfully injects more modernity to the space and I topped it off with a simple black conical paper shade much like the hat on Raquel! A sprinkling of the blueberry in her dress comes in the blue tones of the flower vase. 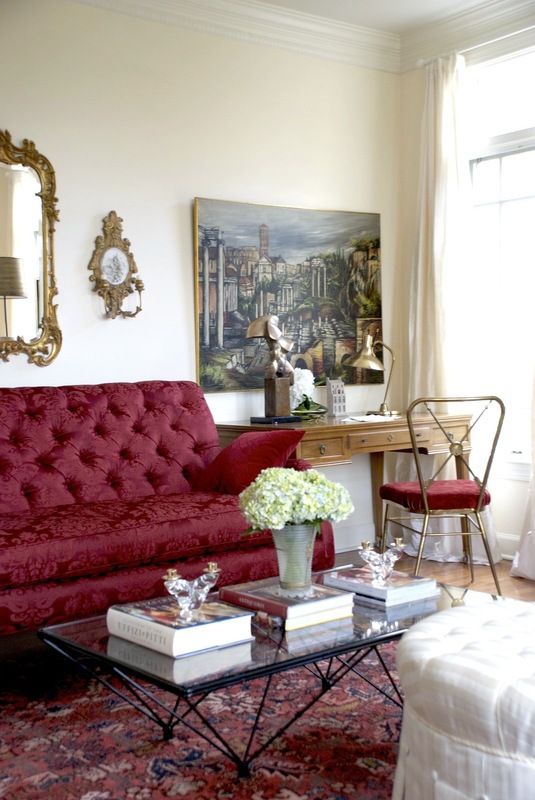 Shades of maroon and brown on the pillows complement the dress further, and you start to see it coming together. But, something was still amiss - we needed more pattern like the ones on the walls. True, pattern could have been introduced in those curtain fabric but like I said, that wasn't happening either. So where to introduce the pattern? The space needed extra seating anyway, so I found a pair of vintage bamboo stools in their original fabric - a floral patterned one in exactly the kind of color tones I was working with. Voila! That did it. Or so I thought. Dear lord, something was still amiss! That could be because the stools were actually quite small so the pattern on the fabric, while a real find, was not good enough scale-wise. At least not by itself. Remember how much pattern there is on the walls of that image? If I can't get the pattern on a wall full of windows by god I was going to create a mural! As a homage to the Vogue image but really on a whim, I painted a figure (on an old 4 x 8 mural) more like a silhouette with a semblance of the Lacroix dress. And I think that worked. I know it isn't that simple. In fact, in reality designing any room inspired by Fashion or anything else is pretty complicated especially if you are fixated with an image like this. This is just a peak into how, as a designer, I get inspired and think through the process of designing. I hope you enjoyed it!